Have you ever met someone who believes they are god’s gift to the world and deserve special attention? How about someone who believes they are worst of the worst and also deserve special attention? Both individuals have essentially the same thing going on: they can’t stop thinking about themselves or get the attention they feel they deserve. They are both entitled neurotic egos. At various times in our lives we have all been there. Almost by definition, ego (Latin “I”) is the center of attention around which turn our circumstances, daily life, the universe, and everything that matters – to us. Ever since we were born our tribe has been busy telling us who we are, where we belong, how we should behave and what we should believe. Some of us had taller powers who told us we were perfect little angels and deserved the very best in life. Others were told that we could never be good enough on our own and would always need someone else’s help to measure up to anything. The adventure of ego (or self-) consciousness on Earth has had mixed results. Certainly the rise of self-conscious actors who could serve as bearers of social identity and cultural meaning marked a significant evolutionary breakthrough. But with it came this susceptibility to self-obsession, believing we are either better or worse than everyone else and consequently deserving of special attention. When you stop and think about it, most of humanity’s greatest social disasters through history can be attributed to the root cause of our neurotic and entitled egos. That orange spiral to the left – which in this blog never indicates anything good – stands for this condition of spinning in ever-tighter revolutions around an insecure identity. In my diagram I have placed math operators next to each of these conditions. The multiplication sign is a magnifier that makes the ego into something exceptional and larger than life, while the division sign is a minimizer in the way it breaks the ego down into something exceptionally unexceptional – helpless, hopeless and waiting for Godot. For the neurotic ego, the meaning of life is a function of either magnifying oneself (“more of me”: superiority complex) or dividing oneself (“less of me”: inferiority complex). This plays out in religion as the difference between those who see themselves as deserving of honor and glory, on one side, and on the other those who regard themselves as damned helpless rejects who need to be saved. In orthodox Christianity the message is that it really is all about you. High-achievers and lowlifes alike can be assured of living forever in heaven as long as they believe in (what the church teaches about) Jesus Christ as their personal lord and savior. Inside popular Christian theism this profound allegiance to the ego and its insatiable craving for attention and immortality is passionately proclaimed as the end-game of belief. You believe so that you will go to heaven, whether because you’ve done good and deserve a hand, or because you’re no good and deserve a hand up. Jesus himself seems to have had a very different message, for the good and bad like: Get over yourself and start caring for others. You are not entitled to anything and you don’t deserve anything, because you lack nothing. Not a pat on the back or a boot on your neck. It’s not all about you. There’s work to be done, so come along! Indeed there is hardly a more tragic gap to be found in all of religion than what separates orthodox Christianity and the spirituality of Jesus. If there’s hope for the Christian religion – and time is running out – it will come by way of a renaissance of his original message and way of life. What makes this unlikely is that the Christian religion has a strong historical momentum of self-centered belief and behavior, and is currently under the management of leaders who can’t get over themselves either. But if they could, what would be different? What else can be done with this evolutionary breakthrough in self-conscious personal identity (ego) besides showering it with glory or casting it down in shame? The answer to that question is where our renaissance will begin. To the right of ego in my diagram are two more math operators, a plus sign and a minus sign. Now, whereas the other operators were “done to” the ego (making it bigger by magnification or smaller by division), these next two are “done with” the ego. The plus sign indicates a move of leaping beyond the ego in connection with, or as Jesus might have said, for the sake of others. This is one way of getting over yourself: psychospiritually getting outside and above ego concerns in order to join the higher wholeness of genuine community. Obviously – or at least it should be obvious – an insecure ego that is spiraling into its own neurotic sense of entitlement will not be capable of self-transcendence or genuine community. There’s too much of “me and mine” getting in the way. When the neurotic ego connects with others it’s typically with the aim of getting the upper hand (×), or else kissing the feet of one we hope will save us (÷). The neurotic ego will also refuse to follow the inward path of subtraction – not reducing ego until little is left (which is division), but dropping past ego consciousness altogether. Such an inward descent entails rappelling the interior precipice of oneself, below personal identity and its whirling tetherball of obsessions, through the nervous system, and deep into the living body’s cradle of biorhythms. All of that descending terrain is what I call the grounding mystery. In this deep inner place there is no separation where thoughts and words might get a toehold. The experience is timeless and ineffable; there we can simply relax into being and be at peace. 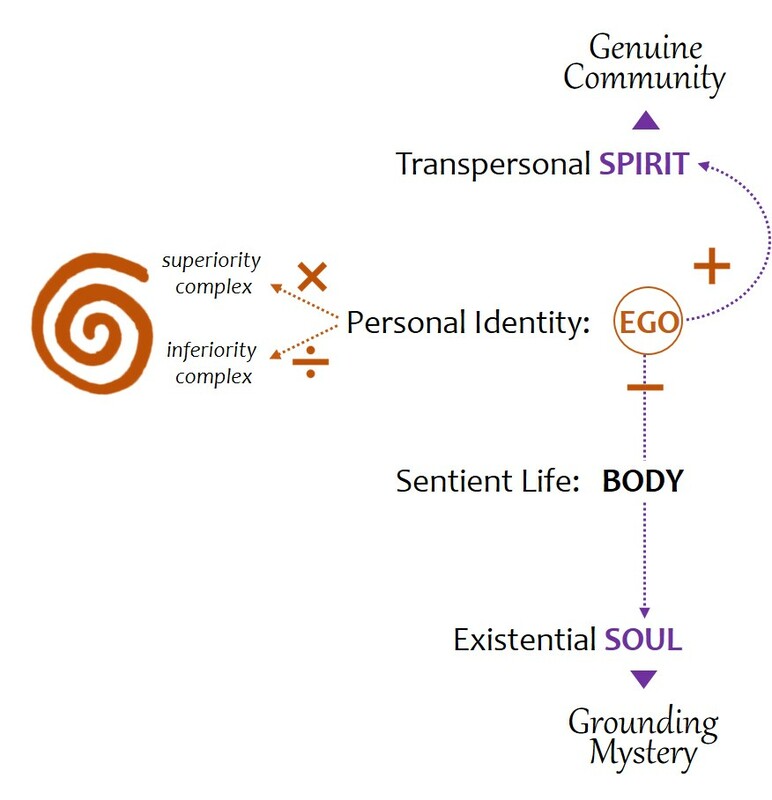 It shouldn’t surprise us that the ascending path of transpersonal spirit (plus sign) and the descending path of existential soul (minus sign) have been consistently condemned in religions where the entitled neurotic ego is calling the shots. These same religions know nothing of the grounding mystery within or what genuine community has to offer. In fact, they are presently the diabolical adversary to the spiritual renaissance our planet needs. When all that matters is what you deserve … well, then nothing else really matters, does it? My last post ended with the controversial statement that a religion which is organized around the goal of getting the individual ego safely to heaven is really a delusion from which we need to be saved. It is widely assumed that religion generally is about everlasting security in the next life, including all the obligations – moral, doctrinal, and devotional – a true believer must satisfy to be worthy of its reward. “True religion” (if I can dare use the term) is actually our path out of this delusion. Central to my larger argument is a perspective on personal (ego) consciousness as a critical stage in our ongoing evolution as a species (and development as individuals), but as only a stage and not the goal. 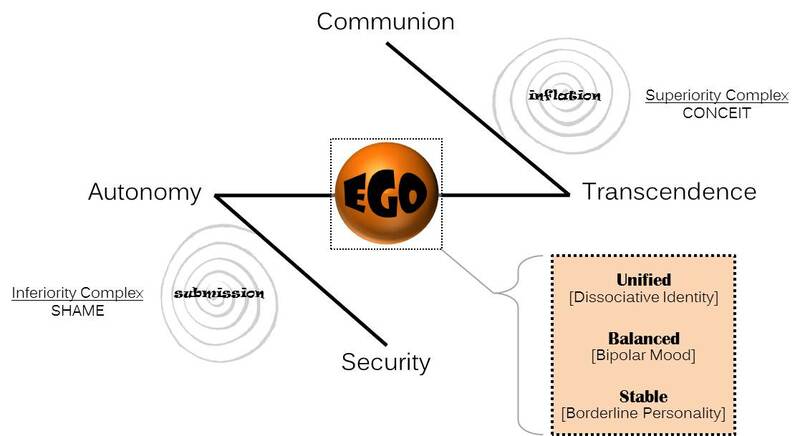 When religion, which had long been dedicated to keeping our inner being (soul) and outer life (body) in holistic balance, got distracted and then utterly derailed by the rising preoccupation with social identity (ego), this shift marked a “fall” of consciousness out of communion and into a state of self-conscious estrangement. And that is exactly what the ego seeking salvation cannot do. If all goes well, security will undergird the next developmental opportunity, which involves the internalization of control. “Autonomy” doesn’t mean complete independence from external resources or absolute control over everything going on inside. It rather refers to an established center of freedom, perspective, intention, and choice in which the individual has some creative control. Autonomy isn’t the end-goal it has become in some Western therapeutic traditions, but its developmental achievement is arguably essential for progress to maturity. And because it doesn’t always go well, we should pause a moment to reflect on what typically happens when security is compromised and autonomy fails. A reality that in general cannot be trusted will compel a coping strategy called attachment – not the healthy attachment between infant and mother, but a neurotic attachment where the insecure individual “submits” emotionally to someone or something with the expectation that security will be found there. Inevitably submission pulls development off a healthy path (to autonomy) and takes it hostage to codependent relationships, repressive ideologies, and damaging addictions. A personality that is held captive by its “idols of security” will tend to take on an inferiority complex where shame – the conviction of being deeply flawed, stained, depraved and unworthy – attracts a dark shadow of helplessness and hopelessness. If it gets dark enough, the individual will go to any length to justify and promote the idol’s absolute authority – and violence is never out of the question. As you might guess, I am of the opinion that much of the “redemptive violence” committed in the name of god and religion – human sacrifice and substitutionary atonement, persecution of minorities and heretics, acts of terrorism and holy wars – has insecurity and shame at its roots. Assuming a healthy establishment of autonomy with the executive ego in control, an individual is prepared for higher experiences beyond the self. Think about such transcendent experiences as inspiration, creativity, compassion, and love, and notice how each one “gets over” the ego for the sake of a higher truth of some kind. Indeed, if an individual is only calculating the prospect of personal advantage or reward in these experiences, they will simply not be available. However, just as before, we need to say something about what happens when security and autonomy are not in place, yet the impetus of transcendence is nevertheless lifting the ego in that direction. What results is a pathology which seems to be the inverse of an inferiority complex, where the ego becomes inflated with conceit, glory-seeking, and self-importance. This is the lesser known superiority complex, and while it seems to be caught up on issues utterly opposite to feelings of shame and inadequacy, ego inflation is really just another coping strategy for the insecure personality. Even if grandiosity is discouraged by religion in its members, the superiority complex can still be celebrated (and justified) in the patron deity who blusters and brags about being the best and greatest, the one and only, who deserves and demands all the worship, praise, and glory. As Absolute Ego, the deity who so comports himself is serving to sublimate otherwise deplorable behavior for human beings into something they can validate and promote through their god. The way Yahweh carries on in some Bible stories has to make you wonder. Before we take our final step of ascent in my diagram and contemplate at last the “so what” of true religion, I want to quickly comment on the telltale marks of ego strength, along with their opposite pathologies. Ego strength is a necessary and desirable achievement of healthy development and shouldn’t be confused with egoism, which is actually a symptom of its absence. In other words, personal identity (ego) becomes stuck on itself when it is weak – insecure, manipulative, and craving attention. A “strong” ego by contrast serves to stabilize the personality, balance its moods, and unify its numerous substreams of impulse, affect, and perspective – what Roberto Assagioli named “subpersonalities.” When these strengths are not present, the individual can be flooded by rising urgencies in the body (borderline personality), swing uncontrollably between emotional extremes (bipolar), or get overrun from within by divergent attitudes and motivations (dissociative identity). I’m doing my best to save these terms from their classification as “clinical disorders” so that we can acknowledge and deal responsibly with them in normal life. At last we can consider where all of this might be leading, assuming that our zig-zag progress from security to autonomy has gone reasonably well – which is not a safe assumption, as I’ve tried to show. So let’s just pretend that we are not caught in the trance of personal salvation, but have seen the vision and heard the invitation to our intended fulfillment. What sort of experience is that? My word is communion: the awareness, the participation, the commitment, and the responsibility of living together as one. Importantly, the prefix “com” when added to the base word “union” prevents the couple, several, or many from dissolving into homogeneity where individual distinctions are annihilated. The valued gains of autonomy and ego strength are not canceled out in communion but instead are connected to other centers, in those higher experiences mentioned earlier: inspiration, creativity, compassion, and love. That is where our liberation finds its fulfillment. Communion doesn’t need to be defined in exclusively human terms of course, even though our most pressing challenge is in the realm of interpersonal relationships. Jesus understood the challenge as especially critical and urgent in our relations with our “enemies,” which doesn’t only – or even most importantly – mean our adversaries across the ocean, the picket line, or the political aisle. The enemies we really need to love most are the ones who daily let us down, betray our trust, exploit our insecurity, abuse our generosity, and don’t even seem to care. They are our family members, our neighbors, our former friends. But that’s another topic – kind of.